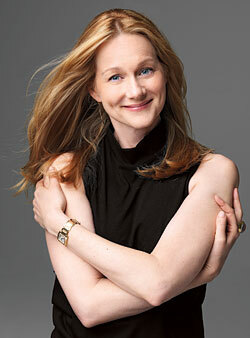 Laura linney has played many conscientious, responsible, levelheaded, sometimes reproving characters. She plays them exceptionally well, better than perhaps any other actress in America. So exceptionally, in fact, that the actress has essentially disappeared into her characters, making Linney herself seem a little … dull. And maybe she is. Her biggest vice, she says, are Swedish Fish. But more likely, Linney just can’t be bothered with perception. She’s of the “it’s the work that’s important” school of celebrity. She would sooner staple her hand to a wall than tweet about picking up a grande peppermint latte at Starbucks. Ask her what people don’t know about her, and she responds, looking slightly stricken, “A lot, a lot. And we’re going to keep it that way.” The intention is to allow the audience to suspend disbelief, but the truth behind the 46-year-old actress’s breathtaking performances—in the HBO mini-series John Adams, in films like You Can Count On Me and The Squid and the Whale, or the plays The Crucible and Time Stands Still—is very dull indeed. “The boring answer is, she’s just very, very good,” says Oliver Platt, who co-stars with Linney on The Big C.